We’d love your help. Let us know what’s wrong with this preview of Original Sin by Greta Cribbs. When Dr. Meredith Bowen gets the opportunity to interview Duane Tolloch, a man convicted of committing multiple murders between 1965 and 1967, all she can think about is the needed boost this assignment will give to her career. A seasoned psychiatrist, she is no stranger to the darker regions of the human mind, but as Tolloch relates hi What drives a man to become a killer? When Dr. Meredith Bowen gets the opportunity to interview Duane Tolloch, a man convicted of committing multiple murders between 1965 and 1967, all she can think about is the needed boost this assignment will give to her career. A seasoned psychiatrist, she is no stranger to the darker regions of the human mind, but as Tolloch relates his tale of a "town curse" and a cycle of abuse that goes back before he was even born, his story shakes Meredith's preconceived notions about the nature of the human psyche, as well as her faith in science, to the core. To ask other readers questions about Original Sin, please sign up. This is my first read of a story by Greta Cribbs and she does a great job of character and world building, especially from the view of the killer. What really makes someone a serial killer? The Original Sin is the first installment in the Crimson Falls series. This is short, but spine chilling tale about a serial killer who believes the town's curse is ultimately at fault for everything he has done. After all, everything happened on Founders Day, October 13 -- Crimson Falls is a town that brin This is my first read of a story by Greta Cribbs and she does a great job of character and world building, especially from the view of the killer. What really makes someone a serial killer? The Original Sin is the first installment in the Crimson Falls series. This is short, but spine chilling tale about a serial killer who believes the town's curse is ultimately at fault for everything he has done. After all, everything happened on Founders Day, October 13 -- Crimson Falls is a town that brings out the worst in people. Dr. Meredith Bowen has been given the opportunity to interview Duane Tolloch, a man convicted of committing multiple murders between 1965 and 1967. The entire interview takes place at the Fallsview Hospital for the Criminally Insane. Steadily, the story unfolds as we get into the mind of a serial killer and see how he developed into the man he is. At the end you may not know whether to feel sorry for Duane or feel he got what he deserved -- or maybe he's right, it's not his fault the town really is cursed -- or maybe it's Eve's fault. Five stars for this installment and start of the Crimson Falls series. I did receive an advance copy from the author and this is my honest review. This was my first book by this author, and wow it was a good one. What makes a serial killer? Are we a product of our enviroment, some will say yes some will say no. This book kept me turning the page to find out what was coming next. I would certainly recommend this book to others. This is the first book the Series and it draws you in and keeps you!!! I kept wanting to turn the pages. The stories told by Duane are hard to picture but draw you in at the same point. Can’t wait for the rest of the Series!!!! 5 plus stars !!!! I love everything about Crimson Falls! In this episode we find a serial killer who seems to blame everyone but himself. Nature or Nurture, what is your opinion? What a mind trip! This takes us deep into the mind of a serial killer and tries to explain the why's. Could someone who did something so horrible actually be a victim himself? Pretty messed up stuff. It sure makes you wonder! 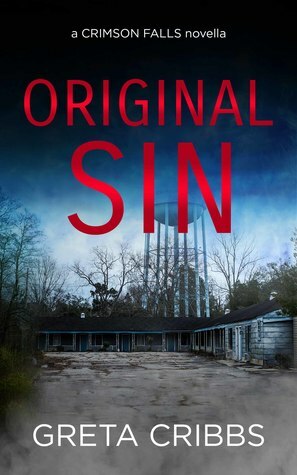 Original Sin is a deep dive into the mind of a serial killer. Wicked. Tense. And expertly exposed. I was enraptured by this story. To be listening to a Serial Killer tell his story and feel empathy for him at the same time was very unsettling to say the least. But, wasn’t that the point? Greta Cribbs delivers a very precise story about psychiatrist Meredith Bowen going to interview Serial Killer Duane Tolloch with a film crew in tow. He is at a Hospital for the Criminally Insane since murdering 3 college students. But, as he tells his story you begin to wonder if he is a product of his upbringi I was enraptured by this story. To be listening to a Serial Killer tell his story and feel empathy for him at the same time was very unsettling to say the least. But, wasn’t that the point? But, as he tells his story you begin to wonder if he is a product of his upbringing? Or, was it that he was conceived on October 13th in Crimson Falls? A different type of read. This novella is different then the rest of the Crimson Falls Novellas. This one makes you think. A psychiatrist goes and interviews a killer from Crimson Falls. He killed 3 girls from college then his mother. It makes you think as to what happened to make someone do something like that. Does it stem from something in their childhood? Definitely recommend. Great introduction into Crimson Falls and the sign of the times when innocence was valued and taken for granted. Such a great story yet chilling and sad. Makes you wonder what really makes a killer do what they do and why. Interesting story. One we have heard many times before but with a definitive twist. He did not blame his mother. Great take on it. Well written and interesting. Original Sin grabbed me from the beginning and would not let me go. This story was gripping, I could not put the book down. Duane Tolloch's voice stayed with me long after I finished reading. This book was amazing ,suspenseful and kept me engaged from the first to the last page.Awesome read . Delving into the mind of the killer was a thrill! Is it the town curse, or the fault of his upbringing that caused Tolloch to become the person he was? Started this book on Saturday morning, and finished by that evening...I didn't want to put it down!